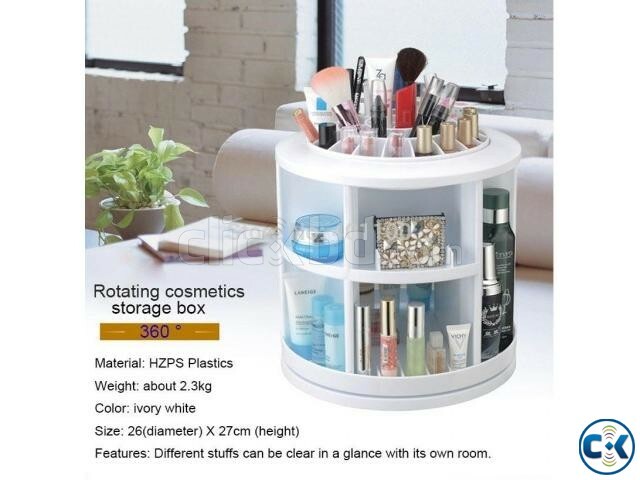 Cosmetic Storage Box 360 Degree Rotation Plastic Makeup Organizer Box Adjustable Multi-Function Cosmetic Storage Box Large Capacity. Brand New and good quality 2.Convenient and creative design, which makes life easy! The 360 Cosmetic Organizer stores all your makeup in a simple and awesome design! The Organizer can hold over 100 pieces of your daily beauty essentials, arranging them in elaborately designed compartments for ultimate efficiency. What's more, it can spin so that you can easily access to your skin care, colored cosmetics, or other grooming supplies! 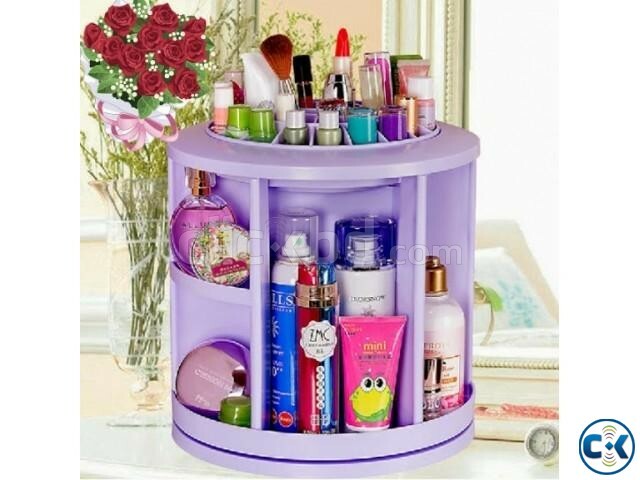 Get This New Desktop Cosmetic Makeup Jewelry Box Storage Shelf 360 Degree Rotation! 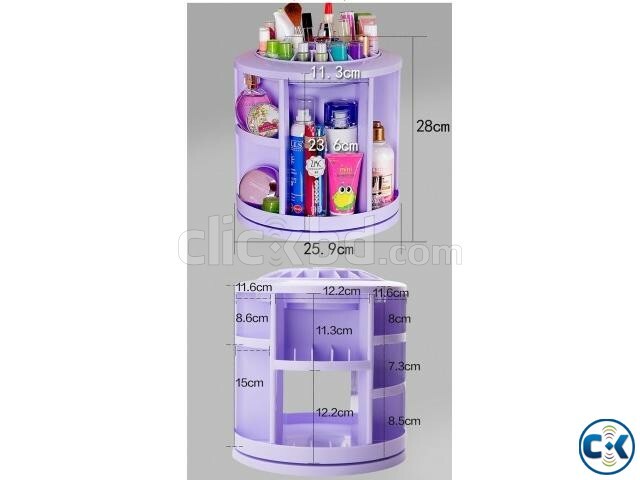 Large Storage Capability: It can be incorporated at least more than 200 large and small cosmetics and skincare products. Such as essential oils, varnish bottle, nail polish bottles, mask, lip liner, eye shadow, anti aging vitamin cream, skincare oil, facial cleanser, skincare bottles, perfume bottles etc. After storage the cosmetics and accessories, you will choose the item you want at a glance. 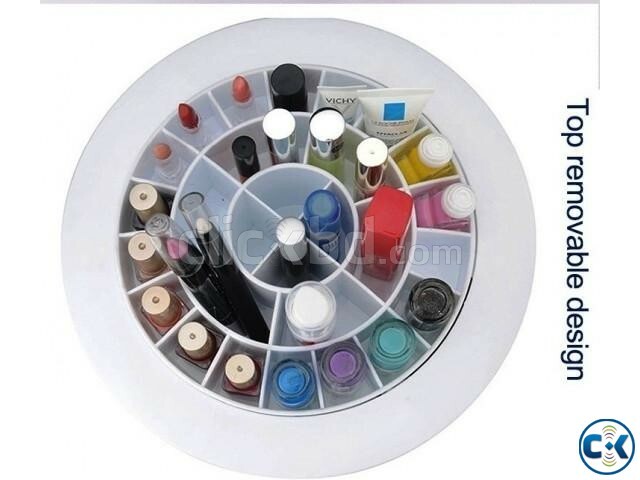 360 Degree Rotating: This makeup box have 8 rolling ball, makes it a rotating tray under the bottom. Round bracket carrying the entire cosmetic boxes, and also makes the cosmetics more stable and secure! Easy to get the item you want without effort with 360 rotation. 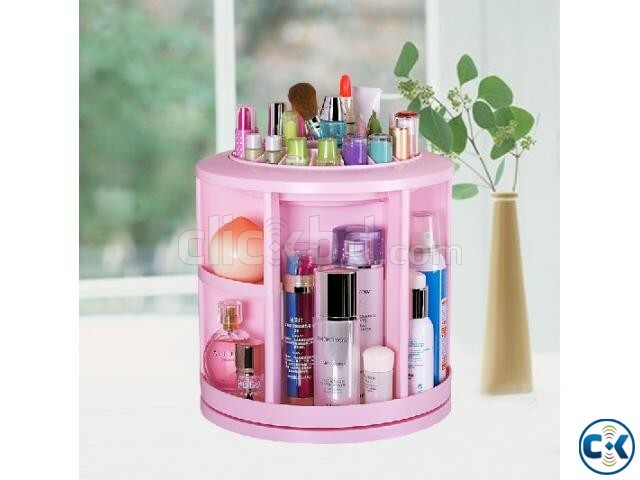 Reasonable Districts for Storage: This round shape storage organizers have 2 larger sections to fit body sprays, perfume, foundations, creams and primers，9 medium sections to place things like nail polishes, beauty blenders, eyeliners, small palettes, 28 sections at the top on the organiser to place lipsticks, lip glosses, mascaras, and concealer. Sturdy PP Plastic and Environmentally Friendly: Good quality of extra thick PP plastic, EVERY LADIE DESERVES ONE. it's worth every penny of it ,non-toxic, tasteless, you can DIY it, using it whatever you wants. Easy to Clean and Great Gift for Girls or Women: This Makeup Skin Care Holder have a Detachable Cover on the top. You can remove (or cover alone) the cover Flexibly. Which makes it easy to clean. As it is such a beautiful box with specification, functional and convenient holder that it can be great gift for any makeup lover, beautician, manicurist.